Hold on tight this is our most thrilling adventure yet. High tempo, action-packed and full throttle fun, our jet boat coasteer will test your limits and fire up your inner dare-devil. Combining an adrenaline-filled coasteering tour with a high speed boat ride, the action kicks off from the moment you zip up your wetsuit. Scramble over rocks and jump from mighty cliffs into deep sea plunge pools, then get whisked away for a white knuckle ride of up to 50kph. To say this is the ultimate thrill experience is a total understatement! We were thinking in epic James Bond proportions when we designed this turbo charged activity in partnership with our high energy pals at Odyssey Marine Adventure. They provide the wave chasing ocean blast while we bring you some of the most spectacular cliffs jumps on the Cornish coast. Together we’re double the passion, double the adrenaline and double the fun – we dare you to join the craziness! For an exploration of the stunning coastline around Newquay, there’s nothing quite like coasteering. It’s up close and personal and takes you to far-flung spots that just can’t be reached without a spirit for adventure. Kitted out in wetsuits, helmets and buoyancy aids, we’ll start out at Towan Beach where we’ll run through safety essentials and techniques before coming face-to-face with the Gazzle, a 2km stretch of Atlantic coast rich in history, heritage and craggy character. Now let the fun begin. With an expert as your guide, ride natural rapids, leap from cliff edges and enjoy the freedom of wild sea swimming. Feel the blood pumping and build confidence with every jump. We’ll push your boundaries, test your bravery and create a buzz like no other. 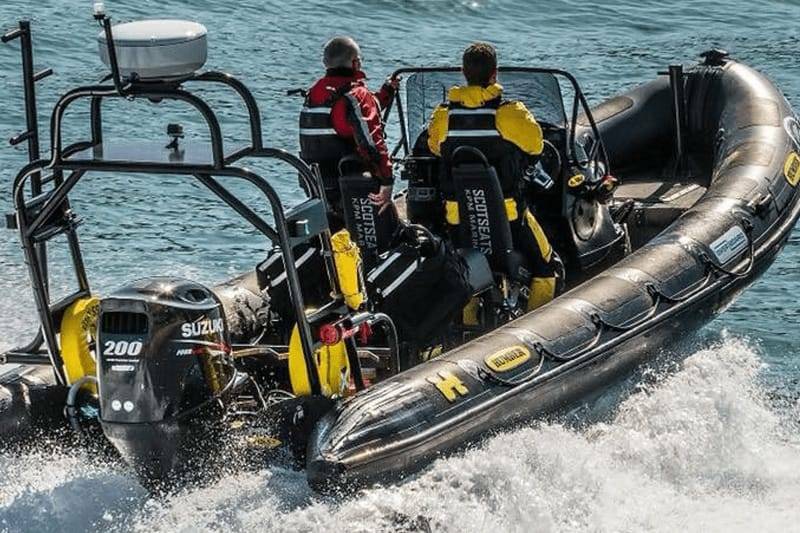 With adrenaline pulsing through your body you’ll get picked up from a hidden inlet by Odyssey Marine Adventure and aboard their Humber Ocean Pro 7.5m zip with incredible speed through the beautiful Cornish waters. The scenery will be breath-taking, the elements invigorating and the energy addictive. Pure exhilaration is the only way to describe this unforgettable experience – you’ve got to try it!